A piece on Manchester freakbeat band St Louis Union and more praise for Chris Wright. According to Wikipedia, St Louis Union were formed by singer Tony Cassidy, guitarist Keith Millar, tenor saxophone/flute player Alex Kirby (left 1965; replaced by Lenni Zaksen and Bernie Brown), keyboardist David Tomlinson, bassist John Nichols and drummer Dave Webb. They formed initially as The Satanists (!) and then, after a name change, won a Melody Maker beat contest in 1965, leaving a fledgling The Pink Floyd in a lower placing, and obtaining a recording contract with Decca Records. Their first single, a cover of the Beatles song 'Girl', was a success in the UK Singles Chart, where it reached #11 in February 1966. 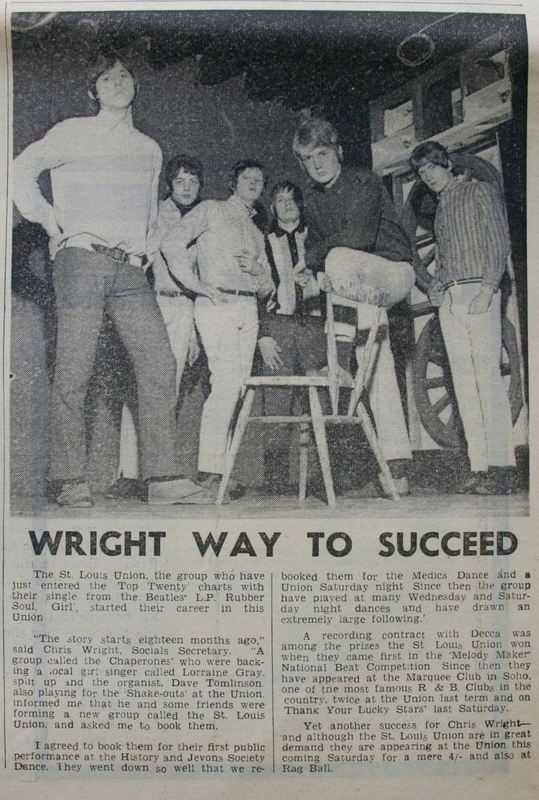 The band split up in 1967. David Tomlinson of St Louis Union became Dave Formula and worked with Magazine, Visage, Ludus and Luxuria. Taken from the Manchester Independent newspaper, written and edited by University of Manchester students. With thanks to James Peters at the University of Manchester Archives and Ben Ward at University of Manchester Students' Union.